What are you gonna make today? Wedding season is just around the corner and I've got some fun ideas for wedding decor and favors! 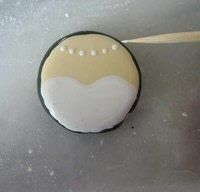 Here's the first one, Bride and Groom Oreo Cookies. The perfect couple deserves another, milk and cookies. Create these flavorful favors with purchased (or homemade) chocolate-dipped Oreos and a set of cake decorating tools. Serve with ice-cold milk in etched champagne flutes or these funky glass milk cartons. To create a cookie couple you’ll need: The less the cookie is handled the better. Pre-dipped chocolate Oreo's are available in certain areas. Check your grocer to see if they carry them. If not you can always dip your own. To do so melt quality chocolate and spoon over the cookie, allow chocolate to set. Prepare the Royal Icing as needed, it should be runny enough to flow, but not so much so it runs over the sides of the cookie. 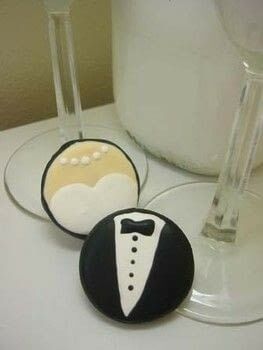 To create the groom, create a V shape with white icing, use the off set spatula to flood the surface of the cookie with the icing and allow to set. 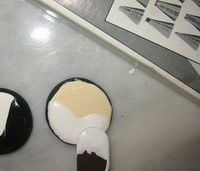 Next, flood the remaining surface of the cookie with black icing, again allow to set. Now use a pastry bag to add buttons and a bowtie. To create a blushing bride, flood the surface of the cookie with flesh colored icing, allow to set. Next, use the off set spatula to apply the white icing, creating the shape of the letter M, imagine what the top of strapless gown would resemble. Use pastry bag or bamboo skewer to add necklace details. To make 3 cups of Royal Icing, you'll need: With a mixer, beat all ingredients at low speed until icing forms peaks, 7- 10 minutes. To prepare the individual colors, divide the icing, one cup each into separate bowls and add a few drops of selected color gels, stir to blend, continue to add color until desired effect is achieved. TIPS: If you’ve not used cake decorating tools before, take time to practice piping and using Royal Icing. It will make the decorating process much easier. 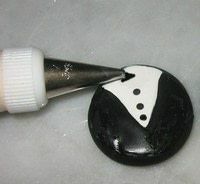 If you’re adept at using a pastry bag for decorating, do so to flood and pipe icing for the necklace, button and bow tie. If however, cake decorating isn’t your bag, the offset spatula and bamboo skewer is sufficient. To avoid mixing colors, allow each application of icing to set up before adding the next color. The less the cookie is handled the better. Pre-dipped chocolate Oreo's are available in certain areas. Check your grocer to see if they carry them. If not you can always dip your own. 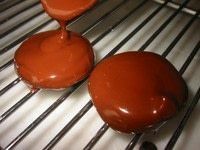 To do so melt quality chocolate and spoon over the cookie, allow chocolate to set. Create a V-shape with white icing use the off set spatula to flood the surface of the cookie with the icing. Allow to set. 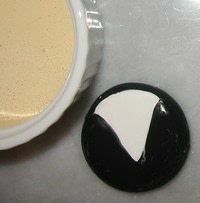 Next, flood the remaining surface of the cookie with black icing, allow to set. 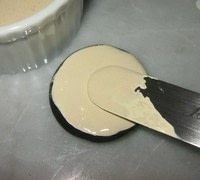 To create a blushing bride, flood the surface of the cookie with flesh colored icing, allow to set. Next, use the off set spatula to apply the white icing, creating the shape of the letter M, imagine what the top of strapless gown would resemble. Use pastry bag or bamboo skewer to add the necklace details.